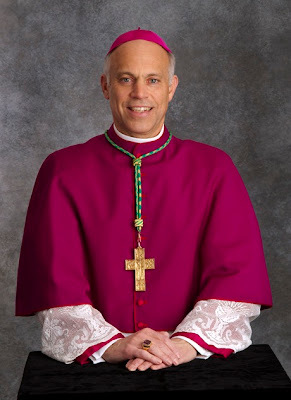 On this Cinco de Mayo, the freshly-dedicated "Space Egg" -- that is, Oakland's Cathedral of Christ the Light -- formally welcomes the Bay Area diocese's fourth head, Bishop Salvatore Cordileone. Despite the size of the 600,000-member church and its presence in a major media market, the 11am Pacific Installation Mass in the $190 million glass-and-steel structure isn't being webstreamed and has gotten little coverage on the ground. For starters, though, especially given the intersection of the 52 year-old prelate's leanings in favor of traditional liturgy with the culturally diverse style of the Oakland church, some might find the posted worship aid for today's rites worth a look. A former staffer at the Apostolic Signatura -- the church's "supreme court" -- and protege of its now-prefect Archbishop Raymond Burke, the March appointment of the former San Diego auxiliary to succeed Allen Vigneron, now archbishop of his native Detroit, raised eyebrows on the church scene, given both the rapid (ten-week) turnover of the process and the placement of a cleric well along the conservative end of the bench's spectrum at the helm of a diocese well known for its progressive ways. While the former can seemingly be chalked up primarily to a months-long delay of the Detroit nod's announcement so that Vigneron might preside at the cathedral's September dedication, the latter's probably best left to the wisdom of the Holy Spirit.